Owned by French drinks company Rémy Cointreau, Bruichladdich Distillery Company is focused around the eponymous Isle of Islay distillery. Bruichladdich Distillery Co produces Islay single malt whisky across three principal ranges: unpeated Bruichladdich, heavily-peated Port Charlotte, and very heavily-peated Octomore. It also distils Botanist Gin in a former Lomond whisky still sourced from the now demolished Inverleven distillery at Dumbarton. With its own bottling plant on site, Bruichladdich employs around 60 people, making it the largest private employer on the island. Bruichladdich distillery was established in 1881, and the Bruichladdich Distillery Co name was first used five years later. The distillery passed through several hands before ending up in the ownership of Whyte & Mackay Distillers in 1993, where it closed two years later. Bruichladdich was famously rescued in 2000 by independent bottler Murray McDavid, headed by Mark Reynier, with production resuming the following year. Under the Murray McDavid regime, the Bruichladdich Distillery Co name was once again employed, and a wide variety of bottlings took place. Ultimately, a policy of only using Scottish barley was instigated, and some 40% of that barley was grown on Islay itself. In 2012 Rémy Cointreau purchased the company for £58 million. Rémy has doubled production at Bruichladdich and has developed an ongoing programme to build new warehouses. Islay distillery belonging to Diageo. 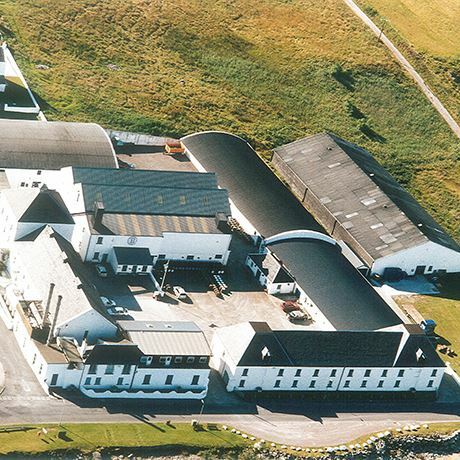 Diageo's Islay distillery produces a smoky, coastal malt, and was once home to the famed Malt Mill.